Inspired by the words of my namesake, Norman Vincent Peale, I have always tried to live a positive life & share messages of hopefulness. Raised in an environment of educators, my belief in increased possibilities is fueled by an undying hunger for knowledge. I have an undeniable passion for the success of our future generations so I have dedicated my focus to help those that want to help our children. My approach to Early Child Development is through experience and the creative expression of the drum provides a direct opportunity to explore new ways of learning. All of my classroom workshops, training & group presentations combine inspiration, motivation & imagination to examine the vast benefits of having rhythm in your life ... finding ways to develop your own beat! 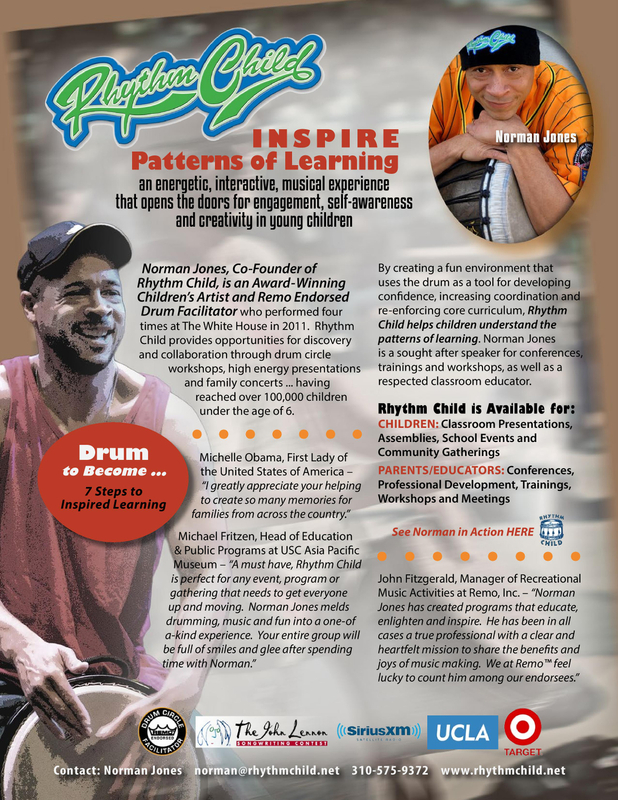 Contact us to schedule a Rhythm Child Interactive Presentation! Drumming has been scientifically proven to benefit health, brain function, social behavior and musical awareness. We have made a commitment to introducing these tools to children. Other cultures around the world maintain music as an important part of their fabric that clearly defines the people, but here we tend to restrict music to being an art form that one either has an aptitude for or not. Schools have the opportunity to teach more than just theory or structure. We can use music as an accessible tool for growth & success. I would love to come and speak with your group ... together we can motivate each other to believe in the rhythm of life. Norm Jones’ Rhythm to Readers workshop was the highlight of the fall ECE Workshop Series at the San Francisco Public library. Through interactive guided rhythmic activities, the early childhood educators experienced the power, playfulness, and magic role of music in preparing children for school readiness. With enthusiasm and expertise, Norm demonstrated how using words and beats help children hear and feel the smaller sounds to develop a child’s phonological awareness, the key skill for decoding process of reading. Who doesn’t love to make music, when you connect that love to Rhythm Child you have an experience you won’t forget. Rhythm Child inspires everyone young and old with their infectious facilitation to grab a drum or an instrument and to make some music together. Truly a family friendly experience that gets everyone up moving and creating music. A must have, Rhythm Child is perfect for any event, program or gathering that needs everyone up and moving. 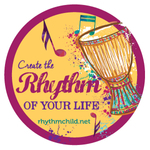 Rhythm Child melds drumming, movement, music and fun into a one of a kind experience. Your entire group with be full of smiles and glee after spending time with Rhythm Child. The session began with Norm Jones warming up on his Djembe drum. I knew I was right where I was supposed to be. He began sharing his story and some of the things he said really struck me. He stated that his goals were to "develop imagination, inspiration, and motivation one beat at a time." I loved when he said, "It's not about the performer. It's about bringing something out from the children. It's about confidence." He discussed the life skills that could be learned through drumming, then led our group through an amazing drumming session.